The whole point of the Mercedes E63 AMG high performance saloon is that it doesn’t look like it can do a million miles an hour, because it is styled discretely. But American tuner Vorsteiner thinks that it has to show off its inner power a bit! So they’ve come up with a new kit for it to do the job. 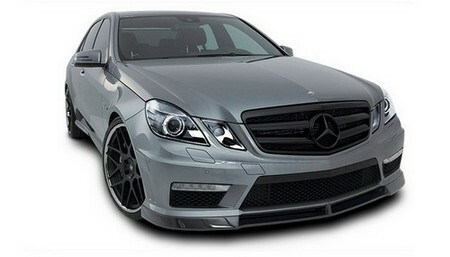 They install a new carbon fiber front spoiler on the front bumper and also replace the bonnet with a blacked-out one. Then they put the new side skirts on which lowers the car a bit, and then at the rear, they offer a new deck lid spoiler plus a new diffuser. To complete the angry style of their E63, Vorsteiner bolts their new black finished V-308 Sport Concave 3-Piece Forged wheels on it.